Studio Investment with Emerald property of Patong Phuket. 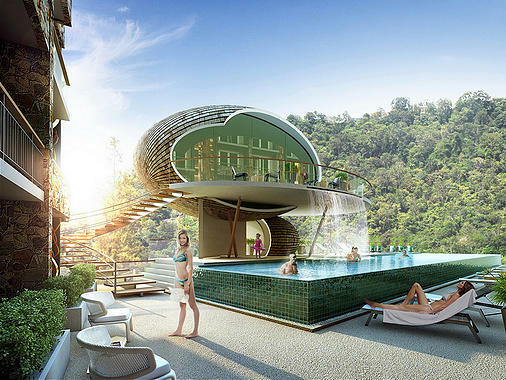 The Emerald Terrace, lush and tranquil hillside condo at Patong. Few minutes away from a plethora of world class amenities, including shopping, fine dining and a world renowned vibrant night life. The project offers condo units of great functional design with brilliant city, mountain, and Andaman Sea views. With it being of very high quality and built to exacting western standards, you can be comfortably assured that this will always be in high demand for both expats and tourists alike. The building is comprising of 7 floors with rooftops totaling 133 units: 98 studios, 21 one bedroom apartments, 8 one bedroom apartments with private rooftops and 6 two bedroom apartments with private rooftops. Construction is underway and is scheduled to be completed in 2014. Emerald Terrace is located on a lush and tranquil hillside on Asia’a finiest resort island of Phuket. Situated well above the much sought-after west-coast beach community of Patong, you will be just a few minutes away from a plethora of world class amenities, including shopping, fine dining and a world renowned vibrant night life. Can crowdfunding transform real estate brokerage in Southeast Asia? Tri Tang Phuket Research Property Group is proud to present two Realty International subscriptions for sale. This is currently under offer. Realty International is part of the growing phenomenon. Many people have a dream of owning a property abroad and despite the fall in sales of Spanish and Portuguese properties and the rise in demand for holiday homes in Bulgaria and Croatia, the Italian market remains constant: in 2012 and 2013 more holiday homes in Italy were purchased by German and English buyers. So, if you are looking to buy yourself a slice of Sicily or a bolt-hole in Bari, here are six things to consider before you start your search.